When it comes to IT infrastructure, hybrid is the new normal. Understanding true performance across cloud-based infrastructure and your on-prem systems can be complex. But with the right monitoring approach, you can expect the same comprehensive insight and quick resolution time from your hybrid environment as you've always enjoyed with your legacy systems. 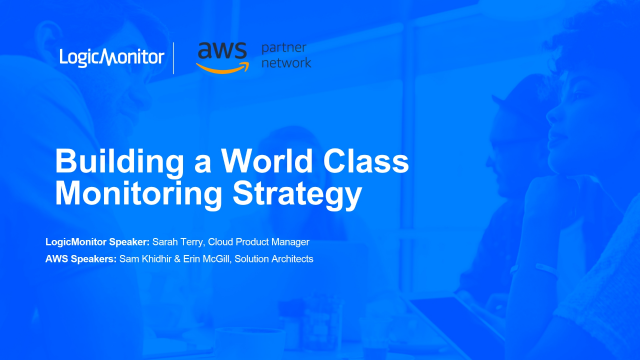 Learn from leading industry experts AWS and LogicMonitor as they present the key components of a world-class performance monitoring strategy, along with a framework to improve monitoring effectiveness. Join AWS Solutions Architect Sam Khidir and LogicMonitor Sr. Product Manager, as they discuss how to build the ideal framework for monitoring effectiveness in a hybrid IT environment. Your cloud journey is underway. That’s a fact. So what’s next and how can you best prepare your organization for long term success? Cloud Vision 2020: The Future of the Cloud from LogicMonitor provides answers. Compiled from the predictions of more than 300 industry influencers, this report outlines the future of the cloud computing industry and contains valuable insights and tips for IT leaders preparing for and continuing their cloud transition. Join Jeff Behl, LogicMonitor Chief Product Officer and William Fellows, VP of Research for 451 Research’s Cloud Transformation Channel as they reveal the survey results and discuss ramifications for the market. -Will Enterprises ever be 100% in the cloud? -What trends are actually driving cloud engagement today? -What will the drivers to the cloud be in 2020? -Which cloud vendors will gain/lose market share? -How can these findings be applied to your cloud strategy? How do you maintain visibility into the performance of containerized applications as containers come and go? The layering of dynamic, ephemeral resources onto service-oriented architectures presents a challenge for optimization and complicates the understanding of true aggregate performance. Are you and/or your hybrid and IT Operations teams tired of being woken up in the middle of the night for non-critical alerts? We’ll show you how to use hybrid monitoring to more effectively track the performance of dynamic services and more quickly identify impacted services for a given alert to optimize service availability and performance. - The Internet of Things (IoT) is pushing compute to the edge with smart devices, creating challenges for latency and scalability. - Software-defined Environments require a complete rethinking of the way data centers are built. If executed correctly, they have the potential to eliminate the bottleneck typically associated with hardware. - Machine Learning presents new forms of data and pattern recognition, which has direct implications for data center security and resource allocation. - Serverless computing, while closely tied to IoT and other application development trends, puts more pressure on the core infrastructure to be scalable and automated. How will this affect today's data center? This session explores the bleeding edge and how data center practitioners can capitalize on its momentum rather than become subsumed by it. Attendees will gain a nuanced understanding of the new technology trends that are taking shape. And they'll leave with strategies to adapt to new pressures and demands. Deploy faster. Monitor more. Empower Ops. LogicMonitor provides 100% visibility of on-premises, cloud and hybrid infrastructure from a single platform. Enjoy automated deployment and maintenance. Monitor infrastructure and workflows end-to-end so that your Ops teams can avoid problems, optimize resources and innovate.